What sets THE salon apart from other hair salons is its dedication to quality: Quality in the technique of its hairstylists, quality of hair products used, and quality in the standard of service. Indeed, THE salon uses products from Goldwell, a German company which does extensive research and development, supplies only to salons, and is highly selective about which salons it allows to carry its products. 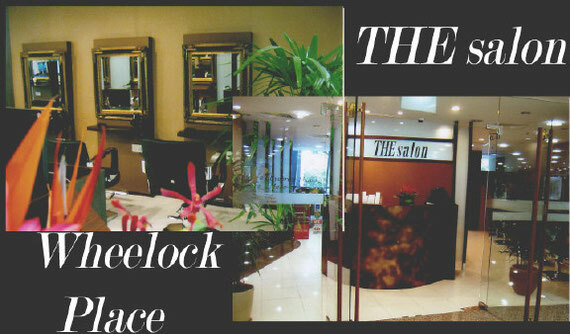 “The Goldwell hair products used are the best you can get,” says Ms Ang. “For instance, the dyes used for the coloring of hair contains the least amount of ammonia as compared to other products available. This means your hair retains moisture and it protects the hair condition. But while it is comforting to know you’re getting the best products for your hair, it is the quality of the hairstylists’ work that is what keeps customers, many of these celebrities, coming back. One such client is Lionel Tan, violist with Singapore’s only professional string ensemble, the T’ang Quartet. “I can come in here, sit back and relax and let them take care of my hair, knowing that when they are done, I’m sure I’ll be happy with the result,” said Lionel. And for him, it is great that the staff at THE salon are always sensitive to his needs, “My schedule is such that I may find myself busy on a day where I have scheduled an appointment with the stylist. The staff seem always aware of my schedule, whether I am in a rush, in which case they’d work at double-quick time, or whether I have the entire afternoon to spare. They’re astonishingly adaptable, and the service … is priceless. And the quality of the work? It’s way up there,” he says. For all the good things, would the prices be “way up there”, too? Surprisingly, for its dazzling reputation as one of Singapore’s top salons, the experience of a visit to THE salon would not leave you bleeding in the pockets. A haircut for ladies costs between $60 and $105, while a gentleman’s haircut is between $48 and $80, which is a very decent proposition for a top-class salon.